If we are to assign a single culture to the Adirondack Park, let it be one of water. Let it run ceaselessly, taking with it what it can and leaving what it must. Let its persistence make smooth the densest obstacle. Let it support life within and joy above. Let our children be buoyant on its surface while others meditate with reel and rod. Let its breeze cool out minds and bodies as it flows out of swamps, through forests, past farms, above dams, beneath rocks and alongside history as rivers have always done. Welcome to the Timeline of Maritime Pastimes (TMP). We are delighted that you’ve chosen to join us. 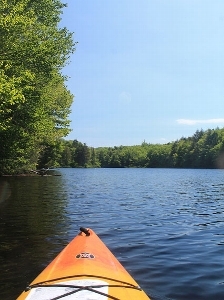 We are here to tell you about the history of water use for sport and leisure in the Adirondack Park and its varied connections to the local culture and identity. Each webpage focuses on a single topic and combines history, culture, science and technology into a single story for your education and enjoyment. Read our essays and interactive timeline. Watch our videos and view our pictures. Maybe it inspires you to see the Adirondack waters for yourself. The park’s history and culture are still very much alive and ready for your contribution. This website explores the cultural significance of water based leisure as more than a simple pastime. In Adirondack waters, visitors and locals alike have found joy and vitality. The rivers and lakes for the 3,000 square mile park drain out in every direction, distributing the lifeblood of the land into Canada, Vermont and the rest of New York State. In the rivers and lakes, people can express athleticism, embrace adventure, and enjoy tranquility in as many variations as the river flow. The history of these pursuits has not always been glamorous or clean, nor is their future guaranteed. But to tell their story is to tell that of the park and in that there is great value. Our website is designed to present compelling information in an organized and accessible manner. So join us on our timeline and maybe you might learn something that you didn’t know before. Experience the intrepid journeys of the Adirondack Guide Boat, navigate the evolution of paddleboats, peruse the short and storied reign of the steamboats, steer into sailing, enjoy the many uses of motorboats and delve into fishing and hunting. Hopefully, by the end of your time here, we have convinced you that to talk about water in the Adirondacks is to talk about more than a place to play. For more information about paddle sports check out this great site.